As a parent, you have the ability to add photos to your child's photo gallery. This article will show you how to upload a parent story with photos so that you can link them to your child's gallery. 1: Go to your child's profile by first clicking on the "Children" tab from the top menu. 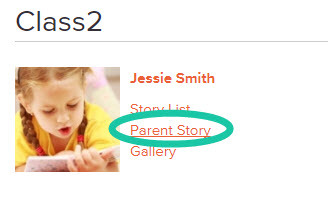 2: Click on the "Parent Story" link, found under their name. You will then be taken to the parent story creation page. From here, you can optionally create a story (adding text into the Story text box or uploading a PDF file or a video) or you can just upload photos in the Story text box if you just want to add photos to their gallery. 3: Click "Upload Photos" to start. This opens a popup to upload your photos, as shown below. 4: First you need to select your photos. Click Add Photos to select the photos from your computer. 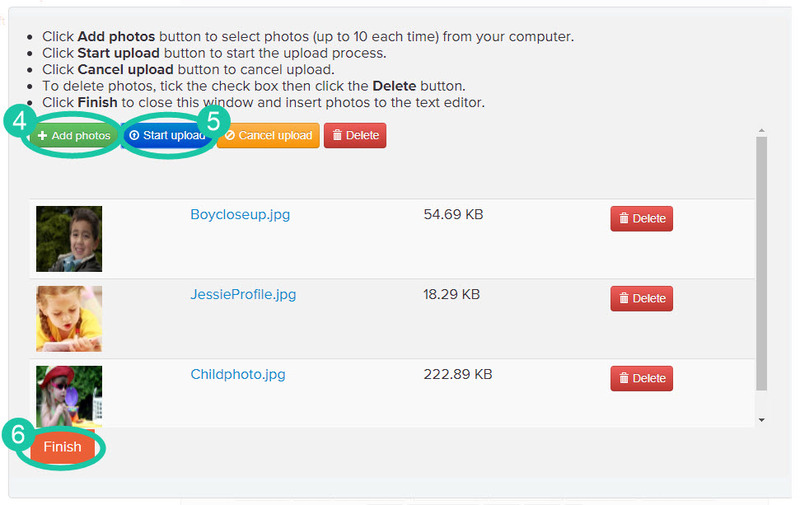 5: Once you have added the photos you want to upload, click start upload at the top of the page. 6: Once your photos have finished uploading (and the green loading bar has disappeared) click Finish. Your photos should now be sitting inside the text editor. You can now edit or resize the images if you would like. 7: Once you have finished with your pictures and the story, click the "Publish" button at the bottom of the story.